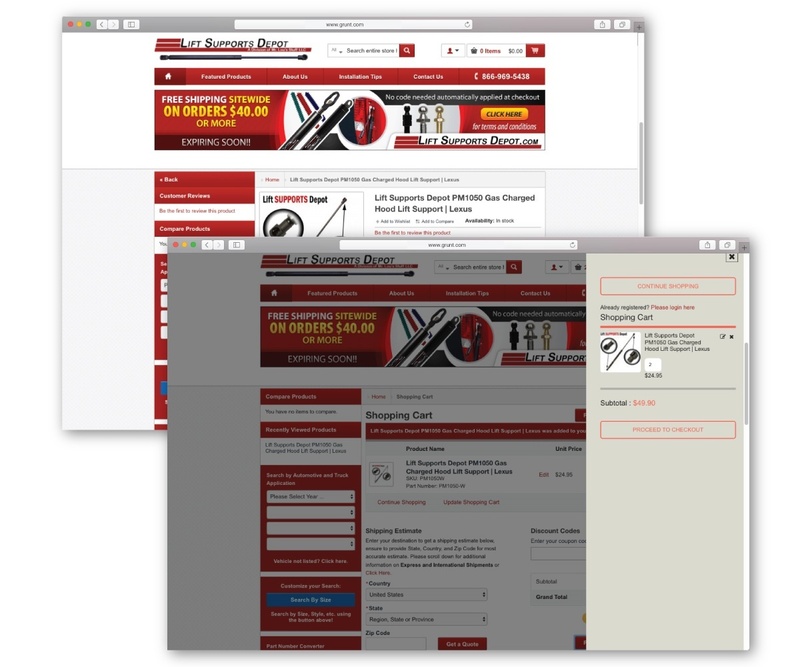 Lift Supports Depot is a successful web-based support lift and specialty automotive business. 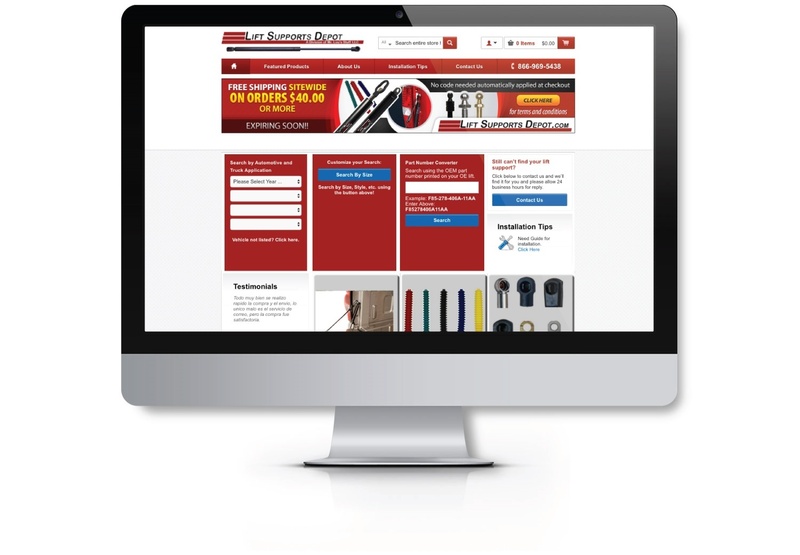 When they reached out to EYEMAGINE, the company already had a strong online store - with their 3.2% conversion rate being well above the industry average of 1.85%. However, their site was unstable and it needed a new code base, new web design, and increased functionality to perform more consistently. To understand the cause of the first issue and determine the most effective solution, EYEMAGINE employed multivariate testing to see exactly what part of the homepage layout’s design was hurting the CTAs' performance. Specifically, the team installed a testing tool (VWO) and created three homepage variants, subsequently testing them all in order to figure out which of the three layouts actually led to increased click-through and conversion rates. The testing results showed that a single version (below), with all three CTA blocks positioned in red at the top of the page, was identified as the top-performing variant, with just under 8% increased conversion rates over the other versions of the page. To fix the second issue of friction in the checkout, EYEMAGINE first conducted a funnel analysis in Google Analytics to get to the root of the problem, analyzing the traffic to Lift Support’s site from organic, direct, and referral sources to see exactly where site visitors were bouncing or abandoning their carts. Ultimately, the EYEMAGINE QA/UX team identified validation as the main cause for drop-off during the conversion process. What does this mean? Validation rules essentially determine what a user can enter into a form field, and in many instances the user experience can be greatly improved by changing these rules and making the forms more user-friendly. To overcome this issue, EYEMAGINE presented two possible solutions to the client: refactoring code on the existing checkout, essentially rewriting the code, or installing and customizing extensions. Option two was the most effective option and it was implemented. The fancy cart checkout extension helped to greatly reduce the issue with validation and friction in the checkout by simplifying and streamlining the checkout process for the site visitors. How? It allowed the shopping cart to appear in the sidebar alongside the product page rather than opening in a new window, thereby allowing customers to either continue shopping or proceed to the checkout without additional clicks or interruptions. Similarly, the integration of the Sphinx search engine, which allows Lift Supports’ search to work faster and produce more relevant results, improved the customer experience on a broader scale, allowing Lift Supports’ prospects to find exactly what they’re looking for right away. Along the same lines, the increased functionality of the blog, which improved its email, printing, social media, etc., allowed customers to easily find and share any information they were looking for on the company’s site. To determine the efficacy of these solutions, the EYEMAGINE team checked conversion rates at the 30, 60, and 90-day marks. Ultimately, these efforts proved to be a success: the conversion rate was increased by 22% during this period of time, resulting in a new conversion rate of 3.42% and thousands of dollars more per month in revenue for Lift Supports Depot.